Whenever we pass a hot pretzel stand -- no matter what time of day it is or wherever we may be -- Kenya and Chloe beg me for one. The two of them will start chanting "PLEASE" so passionately and endlessly, you'd think they were training for the Polite Olympics. Well, who can blame them. I've never met a kid who didn't love him or herself a warm, soft, doughy pretzel to tear into pieces and savor, or just teeth on, as both of my kids did starting from when they were a year old. I remember watching Chloe gum her way through a whole one (after I rubbed every speck of salt off of it!). Now that Kenya is 5, he's starting to realize that we can make at home almost any food that he sees in the outside world. A couple of weeks ago, after Kenya spotted a pretzel place at the mall and performed his well-honed pleading calisthenics on me, I suggested to him that we make pretzels together instead. I am so happy I did. On first glance it may seem like there are a lot of steps to this recipe, but don't let that scare you off. Each one is so easy that even a kid can do them. Stirring, mixing, kneading and rolling the dough are incredible sensory experiences for kids and are great from everything to engaging their fine motor skills to letting them experience how food can transform from one form to another. I like to set aside some of the dough for K & C so they can manipulate it themselves into knots, twists, balls and other imaginatively inspired shapes. Both of my kids were enchanted with the entire process, from making to eating, and our whole family was convinced that our homemade pretzels were just as good as what we could buy at the hot pretzel stand...not to mention much cooler looking. As for my little ones professional pretzel pleading, it hasn't subsided. But at least it all happens at home now. 2. In a large bowl, mix together the water and honey. Sprinkle the yeast over the water mixture and let sit for 10 minutes. 3. In a seperate bowl, whisk together the flour and salt. 5. Rinse out the mixing bowl and then grease it with the oil. 6. Place the dough in the greased bowl and turn it to coat with the oil. Cover the bowl with a kitchen towel and let the dough rest at room temperature for 20 minutes to 1 hour. 7. Place the dough on a lightly floured surface and knead two or three times to remove air bubbles. 8. Cut the dough into 16 equal pieces. Keep the dough covered with a kitchen towel when you’re not working with it. 9. Roll each piece of dough into a 12-inch long rope. 10. Make a U-shape with the dough rope. Pick up each end and cross one hand over the other and press loose ends onto bottom of U to make a pretzel shape. 11. Place pretzels on a parchment or Silpat lined baking sheet, cover with a kitchen towel, and let them rest for 10 minutes. 12. Stir together the water and baking soda. Brush the pretzels with the baking soda and water mixture (if you don\\'t have a brush, you can dip your finger in the liquid and rub it on). 13. Sprinkle pretzels with salt and bake for 15 minutes, or until lightly brown. *This can be done by hand or using an electric mixer fitted with dough hook attachment. These look fantastic! What a fun cooking project to do with the little ones. 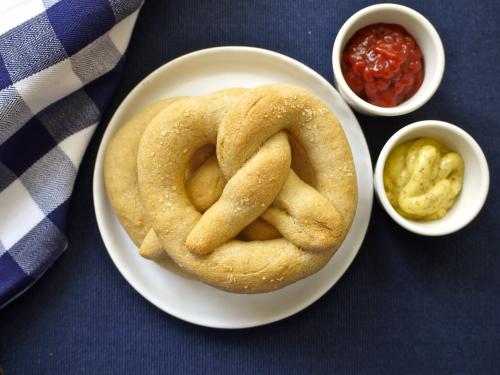 We love making homemade pretzels! Such a fun snack! Quick question - is there any difference (functional or actual) between white whole wheat flour and whole wheat pastry flour? I've had great success subbing the latter for AP flour in your mini muffin recipes. This looks awesome! I cannot wait to make these and maybe experiment with some different 'sauces' for dipping. I have a bag of yeast from Costco so how much should I use for this recipe? 1 packet of Active Dry Yeast is 1/4 ounce, and about 2 1/4 teaspoons! What is the red dipping sauce in the picture? Is it a fruit of some sort? I too found this recipe on peienrtst (how'd we ever survive before it??). I just made it for a Thirty-One party I am hosting tomorrow. Even before the favors have had to fully combine, it tastes amazing! I'm serving it with pretzels and apple slices. These were SO good - I just ate two. Well, three, but I gave a bite of the third one to my husband so pretty sure it doesn't count. Look forward to making these! One question - can canola or vegetable oil be subbed out for anything...butter, coconut oil or other? What are your thoughts on that? I used olive oil and it worked fine. Your timing is excellent. I just looked for a recipe for pretzels on your site a few days ago. I made thae tonight to bring on a picnic to orris. They are lovely and yummy. Thanks. Question... How much of the water baking soda mixture do you use? I painted the tops generously but used maybe one quarter of a cup of the liquid - max. Should the pretzels be swimming in the liquid? The bottoms of the pretzels are a nice brown. I wonder if I'd used more of the water baking soda mixture if they'd look more \"authentic\". Thanks so much. Oh no! I just started this recipe and am out of baking soda! Any substitutions? P.s. had beat pancakes for breakfast. My 2yo ate 2 big ones. I am such a pretzels lover and my huband likes to dip the soft ones in warm mustard, Have you ever tried that check out my blog about choosing thr right school for your precious little ones. &lt;3 the new website design!! Where does one buy white whole wheat flour? I looked in Whole Foods but didn't see any...we made them with regular WW flour and to be honest...not so yummy, although my son's friend ate 3 of them! I used 2 1/2 cups whole wheat and 2 cups white. Turned out awesome! Uh oh. Waiting for the dough to rise and i am worried that I ruined the recipe. After kneading to dough and adding extra flour, it didn't really form a ball. Any ideas on how to save my pretzels??? How long did you knead it? What does it look like? You may just have to knead it a little longer to get it to that smooth elastic texture! Your Pretzels look a bit pale for my taste. Here in Germany a pretzel has to be more or less dark golden brown in color and a little bit reflective. That is achieved by using sodium hydroxide solved in water to coat them before baking instead of baking soda, which is sodium bicarbonate. But please be very careful, as sodium hydroxide (or referred to as \"Natronlauge\" here in Germany, when solved in water) is only obtainable at a pharmacy and can be a bit dangerous when handled carelessly, as it is corrosive... so nothing for children's hands. As for the flour we use white flour with a higher mineral content (called \"Type 550\"). I think \"breadflour\" in the U.S. is similiar. I'm afraid i couldn't find a real bavarian pretzel recipe in english to post it here, to share the goodness; but if you google \"bavarian pretzels\" you should get there. making these right now! and I am also having cheese fondue to dip also!! hope they turn out ok!! am excited!! decided not to use cheese fondue, just pretzels, may try them with a cinnamon sugar topping? idk. we'll have to see how it goes! I will keep you updated! huh. did anyone else read simon's comment? That is very cool that you live in germany!!! When do you mix the yeast mixture? Step 4! Mix together the flours and slowly mix into the yeast mixture after the water/yeast has sat for 10 minutes. It is generally suggested to avoid salt in a baby's diet until they are 1 year old. After that it is okay to give salt in very small amounts, like in these pretzels. As always, check with your pediatrician! Do you freeze your extras? If so, how do you go about thawing them? Do you just put them in the fridge for a day? Can you place the dough in the fridge overnight? I am making them for preschool snack and want them to be as fresh as possible- do you know if i will make them the night before they will taste as good the next morning? Yes! After it has risen for 20 minutes to 1 hour, punch down the dough and knead two or three times. Then place the bowl in the fridge tightly covered with plastic wrap. The next day you'll need to let the dough come to room temperature and then continue with the recipe as written! For the yeast, is it 1/4 oz or 1.25 oz? This always confuses me! It is 1/4 ounce. One packet of yeast equals 1 Quarter of an Ounce! Is your nutritional information right? It says 15 calories per pretzel. That isn't right.